Janaki sings for A R Rahman ! Rahman used singing skills of S Janaki in quite a few occassions. 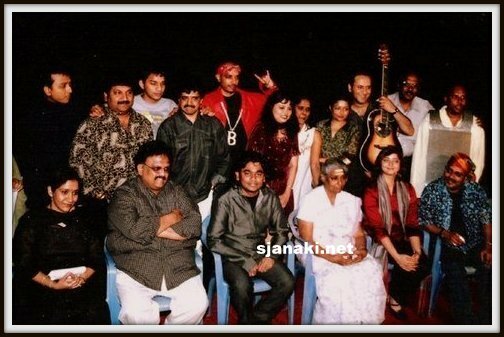 Fantasy is the first album they worked together, where Rahman worked as major keyboard player and when he started giving music in films,he chose S Janaki in movies like Gentleman, kathalan, Uyire, Jodi etc .. He continued giving her songs even in new Millennium. She received Tamil Nadu State award for her song in Sangamam, which came in this combination. When asked to speak about Rahman she says with a blush on her face “I had sung several beautiful songs for Ilayaraja, which were real gems. After IR’s songs and before people started forgetting me, Rahman gave me beautiful songs so that new generation also gets connected to my songs. ” When asked about Janaki in a documentary for her birthday, he said “When you give a song to her, it is no more Rahman’s song, she owns the song so much that it becomes S Janaki’s song “.